(Photo credit: Ed Diller/DiBella Entertainment) NEWARK, NJ (August 15, 2015) – Heavyweights Antonio “Magic Man” Tarver (31-6, 22 KOs) and Steve “U.S.S.” Cunningham (28-7, 13 KOs) fought to a split decision draw in the main event of tonight’s Premier Boxing Champions (PBC) on Spike at the Prudential Center in Newark, New Jersey. Both Tarver and Cunningham fought at a consistent pace throughout the bout, exchanging punches evenly in the early rounds. Tarver caught Cunningham in the fourth round with a sneaky right cross that wobbled the younger fighter who quickly regained his composure and finished out the round. The back and forth action, which left Cunningham bruised and swollen around the eyes, lead to the draw with judges scores of 115-113 Cunningham, 115-114 Tarver and 114-114. In the opening bout of the telecast, Poland’s Krzystof Glowacki (24-0, 15 KOs) scored an 11th round technical knockout victory over Germany’s Marco Huck (38-2-1, 26 KOs) in a huge upset that saw Glowacki capture Huck’s cruiserweight title. Huck was hoping to set a new record for most cruiserweight title defenses with a 14th successful defense tonight. Both fighters were making their US debut in front of a crowd of 5,843, many of which were their Polish and German countrymen living stateside. In the give and take cruiserweight bout, Glowacki came out strong in the early rounds beating Huck with his power and speed on the inside. Huck started to find his rhythm in the middle rounds and out of nowhere put Glowacki on the canvas in the sixth with a punishing left hook to the temple. 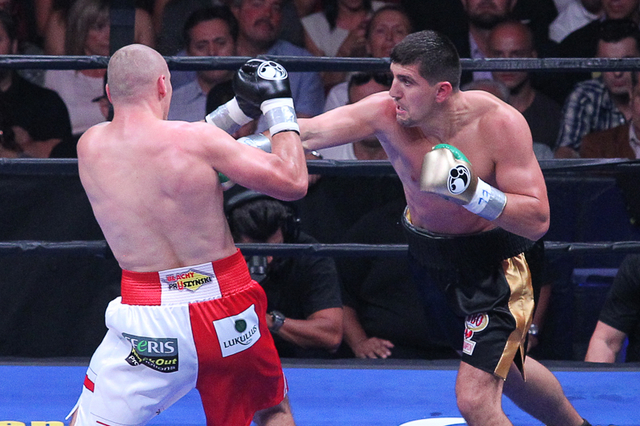 Glowacki recovered quickly and was able to finish the round. Both men stayed busy for the remainder of the later rounds with the judges heeding favor to Huck by the end of the 10th. However, Glowacki came out in the 11th and late in the round put Huck on the canvas with a hard left right combination. Huck beat the count only to have Glowacki jump on him immediately, throwing a series of punches that forced the referee to stop the fight at 2:39 in the round. Glowacki shocked the boxing world with a devastating 11th technical knockout of the 8-1 favored Huck in what will surely be a fight considered for upset of the year. “I knew they weren’t educated on my defense and ring generalship. I threw the harder punches and wasn’t tired. I controlled the tempo, kept my jab busy and feel like I outboxed him too. “I’m the man I’ve always been before and after the fight, and this decision, you won’t find me kicking and screaming. “The US market is now open to me, and fans around the world are going to have to respect the cruiserweight division now. “When I was knocked down in the sixth round I didn’t know where I was and it took me a whole round to regain myself. I still cannot hear well. I was listening to my corner though and when I heard that there was only one minute left in the eleventh round I knew I had to come on strong. Was unavailable for quotes. Both Glowacki and Huck were taken to Rutgers University Hospital for pre-cautionary observation.